I'll be honest, when the Mumnset Blogfest was first advertised, I didn't think it would be that beneficial for a fashion blogger. I imagined long sessions about writing, getting published and a focus on parenting blogs, as opposed to style/fashion related content. I'm delighted to say I was wrong about it. Yes, there were of course sessions on writing but there was so much more than that. Inspirational speakers, blog and social media clinics, photography sessions and of course, a session dedicated completely to Fashion & Beauty blogging that I was lucky enough to be a panelist on. 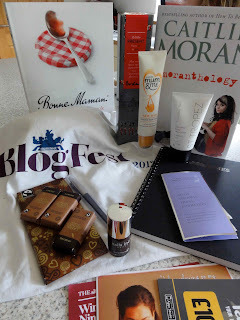 I honestly got so much from the day, useful information that I can apply to my blog, great contacts to keep in touch with and a fabulous goody bag. Before the day had even started, I made some new blogging friends - Lynn from Salt & Caramel, who has written a book about Twitter <respect> and Sandy from Baby Baby blog. First up in the auditorium was Miriam Gonzalez Durantez, a partner at an international law firm…oh and the wife of the Deputy Prime Minister…but she's famously not let that define her. 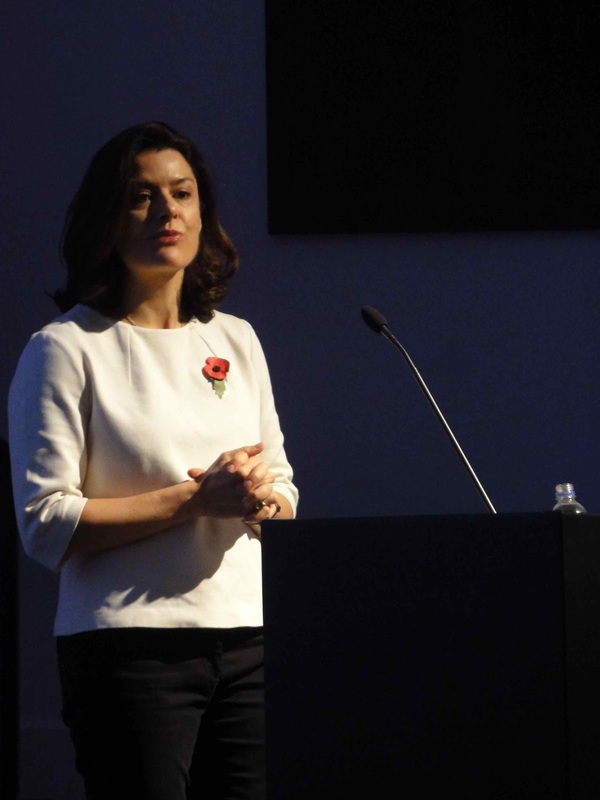 Her inspirational talk about motherhood, the challenges of juggling work and parenting and her anecdotes about her three boys (three boys- eek!) had the whole room falling in love with her. While at this talk I met the lovely Rachael from Pink Blue & You and Frankie from Frankie's Fancies. After this session, I had a lovely chat with Laura, a follower of my blog, who also has a blog of her own (Two Point Four Cycles) and we enjoyed lunch together..while yakking about blogs, clothes and commercial property! Next I took some time out to talk to the girls from Boden and met up with Ellie from The Mumday Times. Ellie was wearing the navy coat I've been trying to get in a size 12 from Primark. Want it even more after seeing it on her! 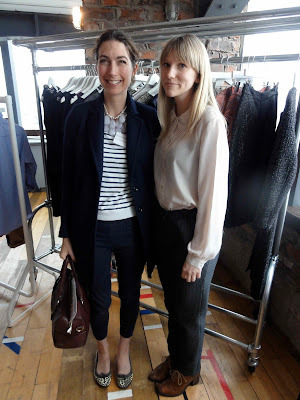 After I checked out the Boden SS13 new range - photos to follow - I went to the green room to prepare for the panel discussion. I mentioned my co-panelists on last week's post so it was lovely to meet them in person. Erica, our chair made use feel so relaxed about the experience and once we were miked up, the session began! In full flow with hands going! Photo courtesy of Mumsnet. 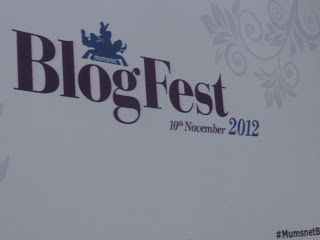 The conversation included some great discussion about getting involved with brands yet retaining integrity as a blogger. 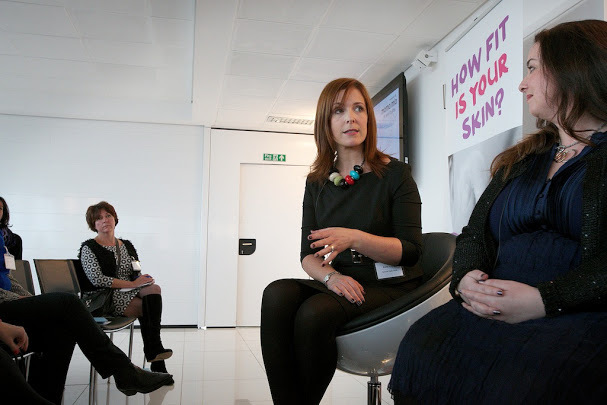 There were lots of questions around approaching brands and how to make money from fashion & beauty blogging and unfortunately not enough time. But I did chat on afterwards with a couple of bloggers who had additional questions, Sarah from All Worn Out and Thea from Journey to Style. Earlier in the day, I'd already spotted (in my opinion) the most stylish woman at the event. I discovered at our session that it was in fact Sian Sutherland, the founder of Mama Mio skincare, sponsors of the Blog Beautiful session I was part of. I managed to have a quick chat and get a photo with her and her gold blazer but not including her pink patent brogues - I have requested a photo from her to share with you! After the break, I had to begin my journey back home as I was flying that evening (though not before I had a quick chat with Transatlantic Mom in the cloakroom queue), so I missed the session 'Private Lives on a Public Stage' and the closing keynote speech from the amazing Caitlin Moran. But the goody bag more than made up for that as it included, amongst other items, Caitlin's latest book….and chocolate….LOTS of chocolate! 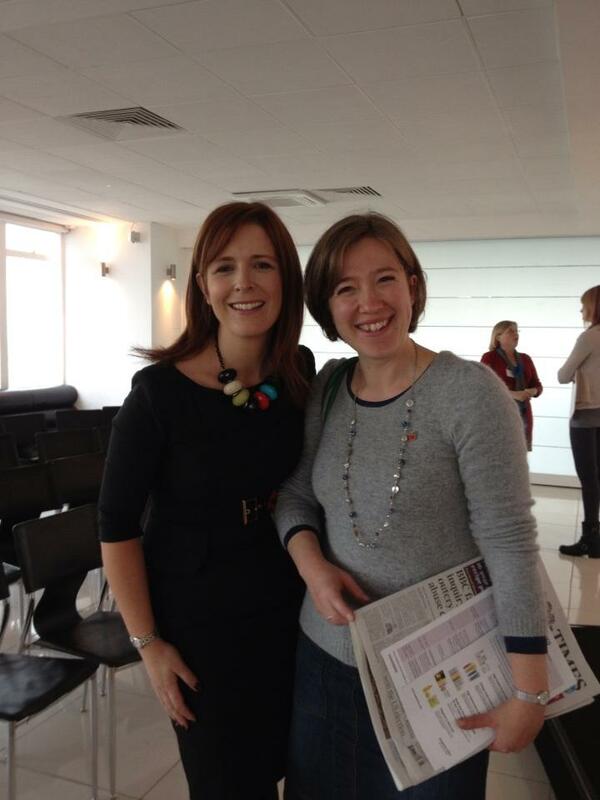 Thank you to Mumsnet Bloggers Network for a great day full of inspiration and lovely co-bloggers. I'm looking forward to 2013 already and next time, I'm staying Saturday night for the party! 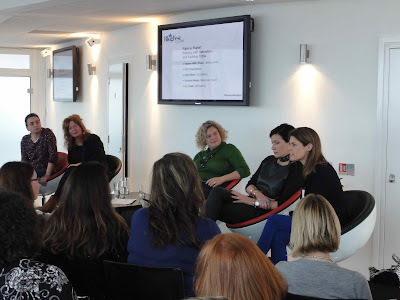 Disclaimer : as a panelist, Mumsnet covered the cost of my ticket to attend the event and my transport costs to and from the event (tho not the extra I had to pay for missing my flight over!!). I was not paid any money to be on the panel, nor am I required to blog about the experience - I just wanted to. All views my own. What a wonderful day - I'm sure you knocked 'em dead as a panelist too. Well done for coming so far in such a very short time! Thanks for linking to my blog, and it was wonderful to meet you. Do get in touch so I have the address for sending your book. I saw Sian around but didn't get the chance to speaking to her. I was wishing for one of Caitlin Moran's famous cards to hand to her. (Caitlin had little cards with 'I love your look' printed on them, for when she does not feel confident about approaching someone to say that she thought they looked great - she simply hands them a card). What a fantastic time - must have been great bonding with like minds! Avril you certainly sounded like you had a great time and all the interesting stuff that was going on. a bloggers sweetie bag! That looks like a really awesome day and you got so much out of it. I would have been fascinated just to hear what was being said. I'm going to check out some of those new Blogs you mentioned now. Sounds like you had an amazing day. I bet you learnt a ton of useful stuff. And does Liz Fraser really look that orange in real life lol? Glad it went well Avril...sounds like it could have stretched to a full weekend! You did a fabulous job as a panelist! A natural talent. Sounds like a wonderful day out. Sounds like a jam packed, fun filled day! So glad you enjoyed it! Oh no! You missed Caitlin?!? Do try to watch a video of her talk (there must be one on Mumsnet somewhere...) because she was BRILLIANT! I was gutted you had to leave early Avril, I wanted a photo of you and I together! Ah well, next time. 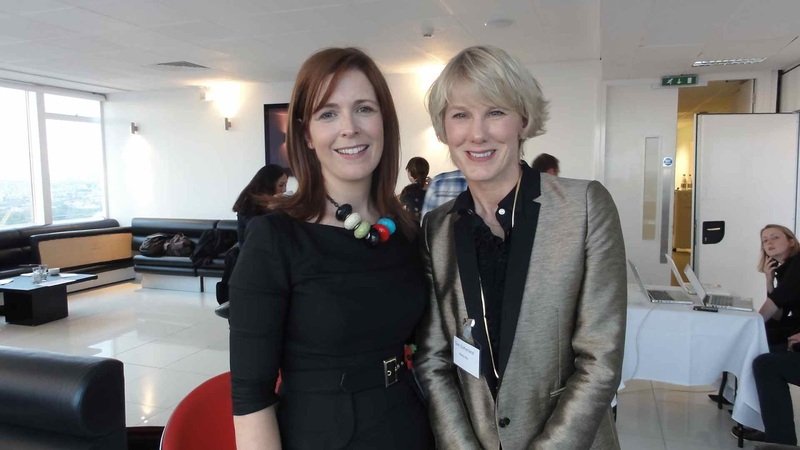 Thanks for including me in your blog post, I'm a very happy mummy. It was lovely to meet you Avril and thanks for the shout-out in your post! I hope you made your flight on time. 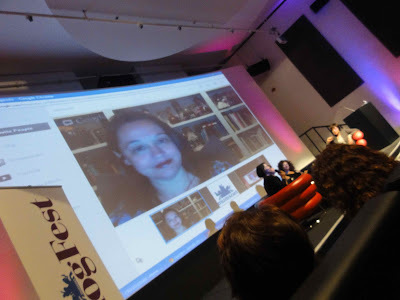 :0) It was lovely to chat - and have already been steering a few ppl in your direction based on some of your experiences and advice you shared on the panel. (And - have just gone back and read your feature in the Daily Mail ) I think you did a fab job on the panel - and wish you'd had a bit more time on the panel to share your blogging experience. I liked how you gave real examples and related it back to how new bloggers could implement it. You insights made it actionable. I thought you were great on the panel, loved what you all had to say, well done!! You looked extremely "well groomed" too...one day I hope to look equally so!! Well done for being on the panel, you are amazing for having the confidence to do it! It would be great to get somehting like this organised in Belfast, even if it was on a smaller scale. Thanks for the mention, Avril. It was great to meet you and - my goodness - it's a small world. I hope to see you again next year! GAH! You were sat right behind me in the trolling session - that's a *mighty* fine picture of the back of my head you have there! Was lovely to meet you, sorry you couldn't stick around for the lovely drinks afterwards. I was NOT trashed. NOT AT ALL.